Helen Grace, now back at Southampton Central following her release from prison, is first on the scene. A break neck thriller which takes place in real time over 24 hours, this is the sharpest, most adrenliased Helen Grace thriller yet. 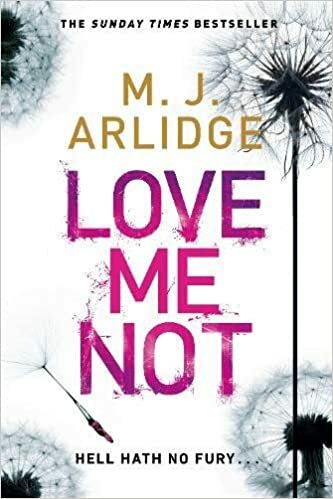 The opening of Love Me Not by M J Arlidge is fast and hard hitting. This has been the case with all of this author’s books so far. He is someone who works pace and tension extremely well. A woman driving to work is flagged down by a girl. She is with someone on the side of the road who appears seriously injured or dead – all is not as it first seems. By chance Helen Grace (DI) is first on the scene and a fast moving “man hunt” is just one of the consequences. An edgy and somewhat damaged Helen Grace is finding it hard to work with the team who were responsible for her arrest and conviction previously. The exception is Charlie who worked very hard in the last book to prove Helen innocent. This twist in the overall story thread worked well for me and keeps a series that might become formulaic from doing so. Another change is that this book runs in a real time way with times creating a real sense of immediacy. Arlidge has always been very good at managing pace and tension but this device took it up a notch for me. The books starts fast and violent and continues that way. If ever there was a book that deserved the line “fast paced, tense police thriller” this would certainly be high on any list. I do like the way this author has managed to keep this series fresh. I’ve read a number of crime series over the years and they do tend to become a little predictable sometimes. This is a great thriller read for me (as have been the previous books in this series) however I do think that this works on more than one level. I think it is interesting to reflect on Helen, a character with some real difficulties in both her past and present, and compare her with Daisy, a key character in this book. There is more to these books than simple thriller action. I confess that this is probably one of my favourite authors and series currently. I can only hope that he can maintain the high level of quality drama in seven books (& a short story) so far and can continue this level of storytelling for some time to come. I’d recommend this book and the series to anyone who likes good tense crime reads. However I would suggest starting at book one if you haven’t tried the series yet. Fans will want to read this anyway.